Video of English Learner Perspective in the USA | So, You Think You Can Teach ESL? So, You Think You Can Teach ESL? Teacher to Teacher Etiquette | 3 Mistakes to Avoid! Don’t Get Mad, Get Silly! 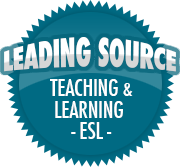 What ESL Program is Right For Your ESL Needs? Teaching Ideas, Workshops, and More!